The case: A healthy 73-year-old man had pain in his left shoulder. He presented to a regional hospital 1 week later with fever, dysphagia, muscle spasms and progressive generalized weakness. His neurologic status deteriorated, which prompted transfer to a tertiary care hospital. Upon the patient's arrival at the tertiary care hospital, our initial evaluation showed irritability, lethargy and hypersalivation. After 48 hours, the patient exhibited multifocal myoclonus and decorticate posturing. Intubation and mechanical ventilation were performed with fluid resuscitation and therapy with vasopressors, corticosteroids and broad-spectrum antibiotics. A computed tomography scan of his brain was unremarkable. An electroencephalogram showed diffuse abnormalities consistent with metabolic encephalopathy. We investigated potential rabies exposure, and his family confirmed that he had sustained a bat bite on his left shoulder 6 months previously but had not sought treatment. We performed a nuchal skin biopsy and obtained saliva and serum samples for rabies virologic and serologic testing. Direct fluorescent antibody staining indicated that the skin biopsy contained rabies virus antigen, and reverse-transcriptase polymerase chain reaction indicated that both the skin and saliva samples contained the rabies virus. 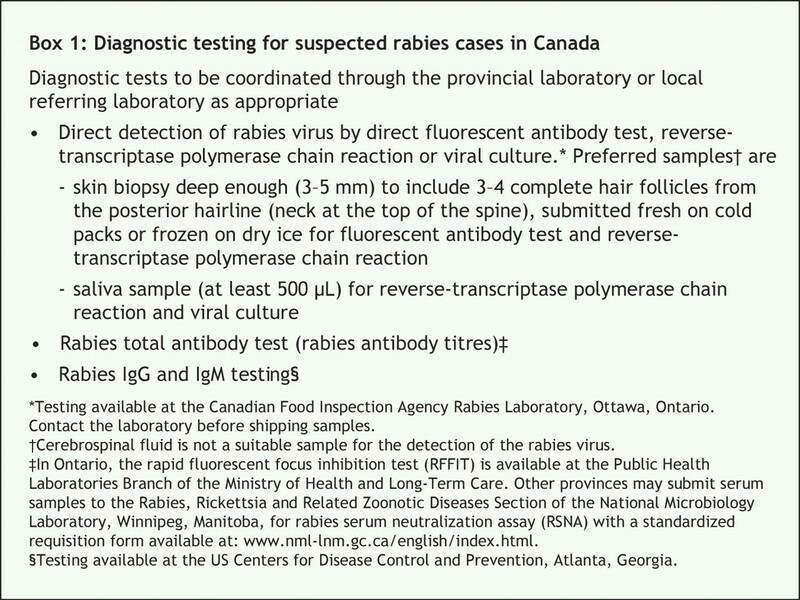 Diagnostic tests available for suspected rabies cases in Canada are described in Box 1. The patient received an intramuscular injection of 1200 IU of human rabies immune globulin. We started the Milwaukee Protocol 15 days after symptom onset (3 days after diagnosis). The Protocol consisted of inducing a therapeutic coma (infusions of ketamine, midazolam and propofol titrated to burst-suppression pattern on the electroencephalogram) and antiviral therapy (ribavirin, amantadine).1 We also provided metabolic supplementation (with tetrahydrobiopterin and L-arginine). We monitored regional cerebral perfusion using transcranial Doppler ultrasonography. Serial serum, saliva and cerebrospinal fluid samples were assessed weekly for immune response and viral clearance. Over time, rabies virus-specific IgM and IgG and total antibody titres rose and viral excretion in the saliva fell. We stopped sedation on day 42, 3 weeks after initiation of the Milwaukee Protocol. Direct fluorescent antibody staining indicated that the repeat nuchal biopsy performed on day 43 was only weakly positive for rabies virus antigen, and reverse-transcriptase polymerase chain reaction was negative. On the same day, transcranial Doppler ultrasonography showed only minor perfusion abnormalities, and the electroencephalogram was near isoelectric. By day 56, results of serial rabies virus tests suggested viral clearance; however, our patient's saliva still contained a low level of the virus. He remained comatose for 4 weeks after we stopped sedation. A neurologic examination on day 64, including apnea testing, was consistent with brain death. However, a nuclear medicine perfusion scan showed preservation of cerebral blood flow. Neuroimaging showed diffuse abnormalities throughout the grey and white matter, including subcortical structures. Together with the patient's family, we decided to withdraw supportive care. The patient died on day 65, about 9 weeks after symptom onset. 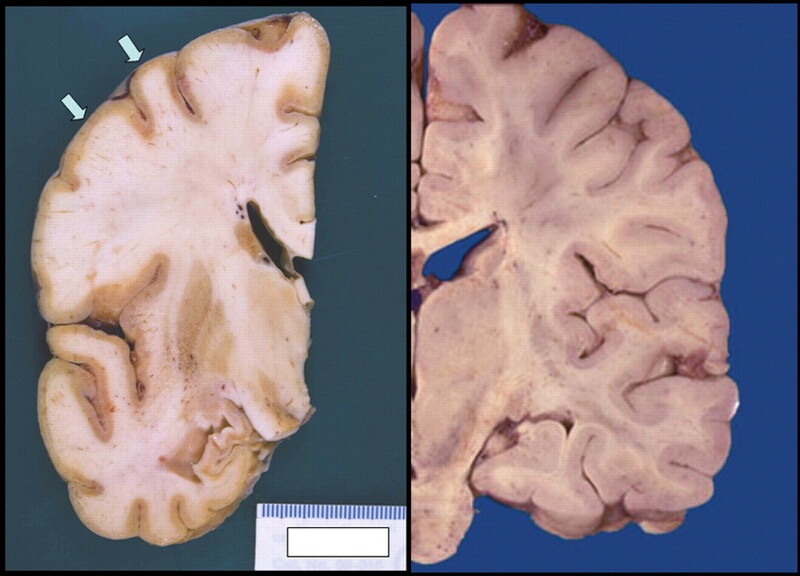 Figure 1: Images of the brain showing (left) thin and discoloured cortical ribbon (arrows) and small hippocampus in a 73-year-old man who died of rabies, and (right) normal cortex. Autopsy revealed purulent leptomeningitis. Microscopic examination of the cerebral cortex demonstrated complete neuronal loss. The cerebellum and brain stem showed relative preservation of neurons; however, Negri bodies (rabies virus inclusions) were present, and viral direct fluorescent antibody staining was positive for rabies virus (Figure 1 and Figure 2). Figure 2: Photomicrograph of cerebellar cortex showing molecular, Purkinje and granule cell layers in the patient. 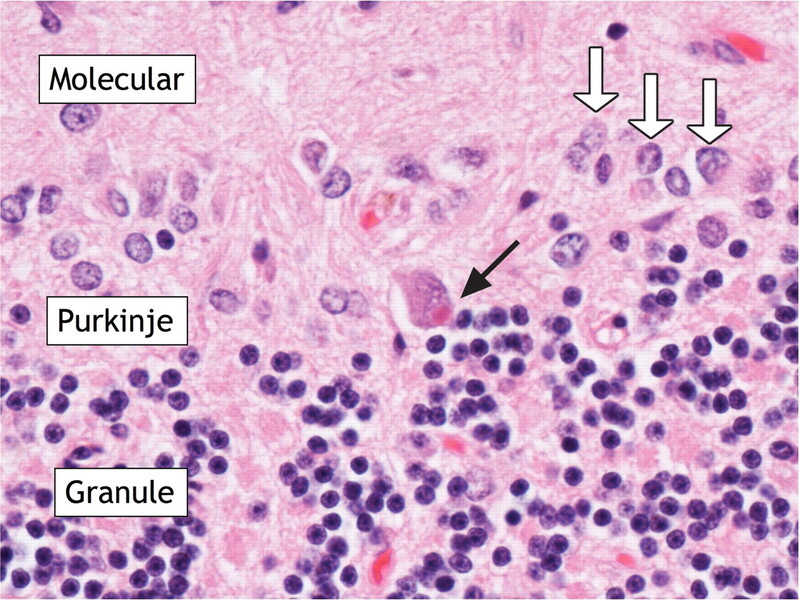 Black arrow points to Negri body in Purkinje cell. White arrows point to astrocytic nuclei of Bergmann cell-reactive astrogliosis. Hematoxylin and eosin stain. Original magnification × 25.5. A public health investigation found that 69 health care workers at the tertiary care hospital cared for our patient before diagnosis. Ten of these workers may have been exposed — either through mucous membranes or nonintact skin — to infectious fluids such as saliva, cerebrospinal fluid or tears. All 10 received postexposure prophylaxis therapy with a single intramuscular dose (20 IU/kg) of human rabies immune globulin (Imogam, Sanofi Pasteur, Toronto, Ont.). They also received a series of doses of human diploid cell vaccine (Imovax Rabies, Sanofi Pasteur) on days 0, 3, 7, 14 and 28, with no reported adverse effects. Six health care workers from other sites and 3 of the patient's family members also received postexposure prophylaxis. 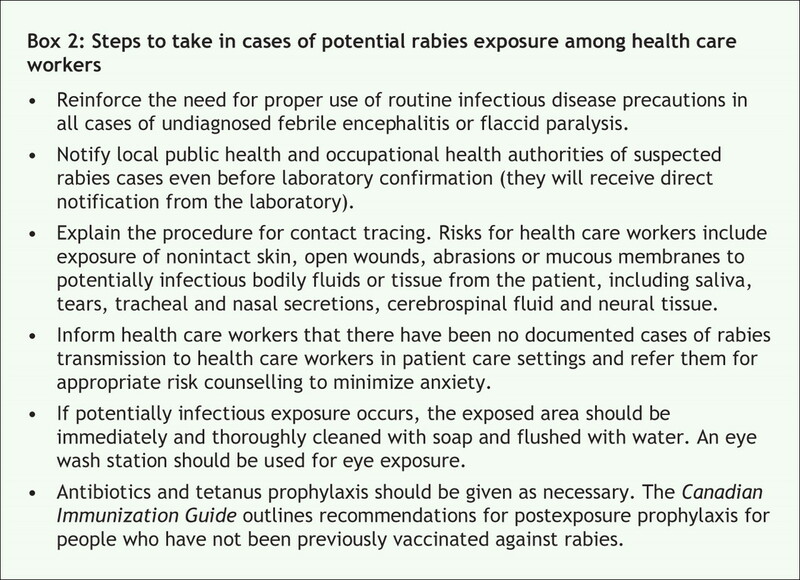 Steps to take in cases of potential rabies exposure among health care workers are outlined in Box 2. Rabies is a neurotropic RNA virus transmitted to humans through the saliva of infected animals, usually from bites. The virus is almost invariably fatal after the onset of neurologic symptoms.2 An estimated 50 000 cases of rabies are reported in humans worldwide each year, with the majority occurring in developing countries and originating from infected dogs.3 In Canada, 27 cases of rabies were reported in humans over an 80-year surveillance period.4–7 Canine rabies is well controlled in North America; however, in recent years, the proportion of human cases due to bat exposure is increasing. For suspected rabies exposures, urgent consultation with a public health official is required. Any bite, wound or exposed surface should be immediately irrigated and washed with soap and water. Wound closure should be avoided. Antibiotics and tetanus prophylaxis should be given as necessary. Clothing that may have been contaminated should be removed. The Canadian Immunization Guide outlines recommendations for postexposure prophylaxis for people who have not been previously vaccinated against rabies.8 Postexposure prophylaxis should not be delayed if there has been significant exposure to a high-risk wild animal, such as a bat, skunk, fox or raccoon. In cases involving healthy, domesticated animals, such as dogs, cats or ferrets that can be observed for symptoms for 10 days, postexposure prophylaxis may be deferred until signs of rabies develop in the quarantined animal or until the testing on the euthanized animal's brain is negative. If the animal remains healthy for 10 days, postexposure prophylaxis is not required. However, people who are bitten in the head or neck by a domesticated animal should start postexposure prophylaxis immediately and stop treatment if rabies in the animal is ruled out. Clinical rabies is characterized by progressive encephalitis and death, and therapy is largely palliative. Although survival has been reported in isolated cases in which patients were symptomatic, all of those patients had received either pre-or postexposure prophylaxis and none had positive test results for rabies virus.9–14 Nearly all of these survivors had disabling neurologic sequelae. Reasons for the high case-fatality rate with rabies are not clear.4 In the early phases, infection seems to induce severe neuronal dysfunction, but little corresponding neuronal cytopathic damage.15,16 Since the pathophysiology of rabies virus infection appears to be primarily neuronal dysfunction rather than inflammation and cell death, the clinical syndrome of rabies encephalitis is theoretically reversible. A fundamental requirement for recovery would be viral clearance and development of a protective immune response. Willoughby and colleagues17 described the survival of a nonvaccinated young girl with encephalitic rabies following an aggressive treatment strategy that included therapeutic coma, antiviral therapy and intensive care support. The strategy, called the Milwaukee Protocol, involves administration of ketamine, midazolam, amantadine, ribavirin and phenobarbitol.1 The premise is that, given sufficient time, antiviral and antiexcitatory therapy will allow for viral clearance and permit clinical recovery. In the case described by Willoughby and colleagues, diagnosis was based on patient history, clinical findings and detection of rabies virus antibodies in the patient's blood and cerebrospinal fluid. However, the rabies virus was never isolated, which raises speculation that her recovery was attributable to factors other than the Milwaukee Protocol. Five additional cases of human rabies treated with the Milwaukee Protocol have recently been described (Table 1).18–20 None of the patients had received postexposure prophylaxis, they all presented with clinical disease, and none survived. Interestingly, despite the detection among these patients of antibodies specific to the rabies virus, which suggests an immune response, and evidence of viral clearance, autopsies of most of the patients still revealed the presence of the rabies virus. In our patient, there was radiographic deterioration and no evidence of recovery despite treatment with the Milwaukee Protocol. Based on the hypothesis that rabies encephalitis may genuinely mimic clinical brain death and that the only surviving case known appeared to be clinically brain dead in the early phase of illness,1,17,21,22 our patient received prolonged supportive care. Although our patient showed evidence of both an immune response and reduced viral detection, autopsy results indicated the presence of the rabies virus in his brain. Our findings suggest that evidence of peripheral viral clearance failed to correlate with true viral clearance from the central nervous system . The initial success with the Milwaukee Protocol has yet to be replicated.17 The management of clinical rabies in nonvaccinated patients is largely palliative, and death is invariably expected. However, there remains considerable interest in therapeutic strategies intended to improve this outcome. Cases of rabies in humans will most certainly continue to occur. In such instances, if the Milwaukee Protocol is used, it should be done in carefully selected circumstances — ideally in the context of a clinical trial — with explicit understanding of the uncertain benefit and clinical commitment and of the resources required.4 In addition, we also believe there should be clear outcomes of therapy established to avoid unnecessary and protracted support. Rabies remains an important public health issue. There is need for continued vigilance and public awareness, education of health care workers, and prevention with early postexposure prophylaxis when indicated, all of which are proven to prevent clinical rabies. Acknowledgements: We thank Dr. Susan A. Nadin-Davis, Dr. Alexander I. Wandeler, Francis T. Muldoon and the staff from the Canadian Food Inspection Agency in Ottawa, Ont. ; Elaine Cheung, Marsha Shaw and the staff from the Ontario Ministry of Health & Long-Term Care, Public Health Laboratories Branch, Etobicoke, Ont. ; the virology and distribution staff at the Provincial Laboratory for Public Health, Edmonton, Alta. ; and Dr. Mark Joffe from Occupation Health, Safety and Wellness, Capital Health, Edmonton, for their assistance during the management of our patient. We thank Dr. Lothar Resch for the gross pathology and histology images accompanying this report. We also thank Dr. Rodney Willoughby from the Medical College of Milwaukee in Milwaukee, Wis.; and Dr. Richard Franka, Dr. Charles Rupprecht, Lillian Orciari and the staff from the US Centers for Disease Control and Prevention in Atlanta, Ga., for consulting on the course of care of our patient and for performing the reverse-transcriptase polymerase chain reaction tests and rabies IgG and IgM assays. Medical College of Wisconsin. The Milwaulkee Protocol. 2nd edition. Available: www.mcw.edu/display/displayFile.asp?docid=11807&filename=/Groups/Pediatrics/InfectiousDiseases/Milwaukee_rabies_protocol2_1.pdf (accessed 2007 Oct 22). Jackson AC. Rabies. Can J Neurol Sci 2000;27:278-82. Jackson AC. Update on rabies. Curr Opin Neurol 2002;15:327-31. US Centers for Disease Control and Prevention. Human rabies — Quebec, Canada, 2000. MMWR Morb Mortal Wkly Rep 2000;49:1115-6. Parker R, McKay D, Hawes C, et al. Human rabies, British Columbia — January 2003. Can Commun Dis Rep 2003;29:137-8. Varughese P. Human rabies in Canada — 1994–2000. Can Commun Dis Rep 2000;26:210-1. Public Health Agency of Canada. Canadian immunization guide. 7th edition. Ottawa: Health Canada; 2006. Available: www.phac-aspc.gc.ca/publicat/cig-gci/p04-rabi-rage_e.html (accessed 2008 Jan 11). Alvarez L, Fajardo R, Lopez E, et al. Partial recovery from rabies in a nine-year-old boy. Pediatr Infect Dis J 1994;13:1154-5. Gode GR, Raju AV, Jayalakshmi TS, et al. Intensive care in rabies therapy. Clinical observations. Lancet 1976;2:6-8. Hattwick MA, Weis TT, Stechschulte CJ, et al. Recovery from rabies. A case report. Ann Intern Med 1972;76:931-42. Madhusudana SN, Nagaraj D, Uday M, et al. Partial recovery from rabies in a six-year-old girl. Int J Infect Dis 2002;6:85-6. Porras C, Barboza JJ, Fuenzalida E, et al. Recovery from rabies in man. Ann Intern Med 1976;85:44-8. US Centers for Disease Control and Prevention. Rabies in a laboratory worker — New York. MMWR Morb Mortal Wkly Rep 1977;26:183-4. Jackson AC. Rabies: new insights into pathogenesis and treatment. Curr Opin Neurol 2006;19:267-70. Weli SC, Scott CA, Ward CA, et al. Rabies virus infection of primary neuronal cultures and adult mice: failure to demonstrate evidence of excitotoxicity. J Virol 2006;80:10270-3. US Centers for Disease Control and Prevention. Human rabies — Indiana and California, 2006. MMWR Morb Mortal Wkly Rep 2007;56:361-5. Hemachudha T, Sunsaneewitayakul B, Desudchit T, et al. Failure of therapeutic coma and ketamine for therapy of human rabies. J Neurovirol 2006; 12: 407-9. Schmiedel S, Panning M, Lohse A, et al. Case report on fatal human rabies infection in Hamburg, Germany, March 2007. Euro Surveill 2007;12:E070531.5. De Tourtchaninoff M, Hantson P, Mahieu P, et al. Brain death diagnosis in misleading conditions. QJM 1999;92:407-14. Hantson P, Guerit JM, de Tourtchaninoff M, et al. Rabies encephalitis mimicking the electrophysiological pattern of brain death. A case report. Eur Neurol 1993;33:212-7. Human rabies prevention — United States, 1999. Recommendations of the Advisory Committee on Immunization Practices (ACIP). MMWR Recomm Rep 1999;48(RR-1):1-21. Gibbons RV. Cryptogenic rabies, bats, and the question of aerosol transmission. Ann Emerg Med 2002;39:528-36. Gibbons RV, Holman RC, Mosberg SR, et al. Knowledge of bat rabies and human exposure among United States cavers. Emerg Infect Dis 2002;8:532-4. Hoey J, Todkill AM. Bat rabies after undetected exposure: implications for prophylaxis. CMAJ 1997;157:55-6. Health Canada, Laboratory Centre for Disease Control, Division of Nosocomial and Occupational Infections. Routine practices and additional precautions for preventing the transmission of infection in health care. Can Commun Dis Rep 1999;25(Suppl 4):1-142. Hu WT, Willoughby RE Jr, Dhonau H, et al. Long-term follow-up after treatment of rabies by induction of coma. N Engl J Med 2007;357:945-6.